Halloween is fast approaching and everyone is excited, except for your child. You’ve learned to get the cute decorations instead of the scary ones. You skip Halloween movie previews and haunted houses but what about the stuff you can’t control? How can you prepare your timid little one for a season of scary surprises? Here’s what to do when you can’t hit fast forward on October and put an end to your child’s Halloween fears. Halloween happenings pop up everywhere in October. You might not notice them if you’re not overly sensitive to zombies and skeletons but take it from a barely-recovered scaredy cat– the minute fall is in the air the Halloween talk begins. If your child is in day care or attends school let their staff or teachers know about your child’s fears. Chances are they have a kid or two like this every year and with Halloween coming so early in the school year they will appreciate you giving them a heads up. No one likes to play the what’s-wrong-with-Johnny game mid-meltdown. Does your child have a Halloween-themed field trip coming up? Is school doing a costume parade? We’re all conditioned to follow the rules but it’s 100% okay to have them not participate in activities that might cause fears to escalate. If it’s an event you can attend to help them navigate their feelings then it might be a good learning experience but if not, there’s no shame if putting your child’s feelings before their perfect attendance record. For some reason it’s everyone’s first instinct to minimize little ones big feelings. If you know your child is going to be so scared of a Halloween related event that you both are going to have a miserable time then opt for a different activity. Don’t let someone else tell you they will “probably” be fine or sway your momma-instinct on how to handle your child’s Halloween horrors. You know what’s best and honoring your child’s feelings and reminding them that their fears matter is an important part of your relationship. There are more and more family-friendly events popping up for every holiday. Finding a less-scary alternative like a trunk-or-treat event, an early evening hayride or even a family candy swap can take the pressure off feeling like you need to trick-or-treat with the masses. If you know ahead of time you’re child’s going to be covering their eyes all night, plan something else fun to do in costume so you both feel like you got the most out of the evening. No matter what you do about your child’s Halloween fears, taking the time to let them know you hear them loud and clear is a great first step. 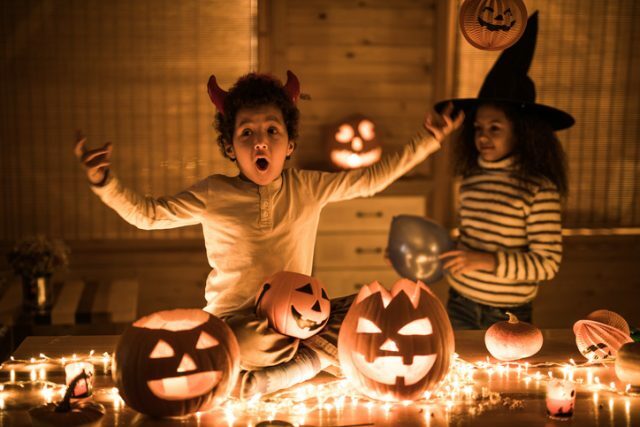 Knowing their Halloween happiness is a priority for you and you’ll exit stage left the minute they are too afraid will greatly lessen their anxiety. Having a supporting, understanding parent in your corner is even better than discovering the house that’s handing out those full size candy bars.